Discussion in 'Acronis Disk Director Suite' started by A320, Oct 17, 2008. Searched through the forum and found some similar threads but nothing that describes exactly what I am experiencing. I'll try to explain it in concise steps so it makes the info a bit easier to decipher. - 1 SATA 320GB Hard Drive with several partitions. 4) I install Vista in the selected 'V' partition. 7) I reboot the computer and start it with an Ultimate Boot Disc that contains a utility called MBR Wizard. I use this utility to once again make my XP partition the 'active' one again. [noparse] [/noparse] I reboot again and as expected I am back to Acronis OSS. I see my 2 previous OS's (XP & Leopard) and try to search for Vista to add it to here but it doesn't find it. I continue to select to boot to XP. It then proceeds to that same screen as before that asks you to select between booting Vista or an older version of windows. Confused, I tried to see if it would go to Vista from here and of course it did. I reboot, get back to the same screen via the same previous steps through Acronis OSS and select the older version of windows and voila I get back to my XP and interestingly when I get into XP, it has the drive letter 'C:' and Vista partition is now 'V:' again. 1) Why does the 'C:' letter assignment jump between both XP and Vista when I run each one? 2) Why does Acronis OSS not find the Vista installation on it's own, but when I select the pre-existing WinXP option in the menu, instead of just going into XP, I get to the Vista created menu that allows me to choose between the two versions of windows. In conclusion, I am obviously able to select and get into all 3 OS's but the change up has me confused. Obviously the computer is booting up from the partition that had the initial XP install as that was where Acronis OSS is and I am getting there. But how come I couldn't add Vista to the list in Acronis OSS, and instead can get in to it in a round about way by selecting XP in the list and then getting to the Vista screen that asks which Windows I want to start. I am moderately knowledgeable in this area (got this far didn't I?! ) but don't know too much about MBR's and boot.ini's etc etc. Obviously the right partition is active now, but is there a mixup with the MBR or some other boot file. Thanking you guru's ahead of time for reading. The drive letters assigned to each partition are assigned by the OS, not by the computer. XP can have whatever letter it wants for the Vista partition. When you install Vista, it will default to C: for the Vista partition (this is normally the best letter to use). This is completely normal. This happened because the XP partition wasn't hidden (and possibly the Vista partition wasn't Active) when you installed Vista. Now Vista has taken over the booting of XP and both are booting from the XP partition. It's usually best to avoid this scenario if you want isolated installations. They can be separated so they boot from their own partitions (instructions can be found here). OSS has a problem properly detecting multiple operating systems using Vista's boot manager. Sometimes it will only get one, sometimes it will get two that both boot to the Vista boot menu. First off, thank you for the lightning speed response! I have just started sifting through your link there, I see you've been busy! I haven't dove into it yet, to solve my dilemma about separating the two, will there be re-installing involved, or can I 'fix' the issue? 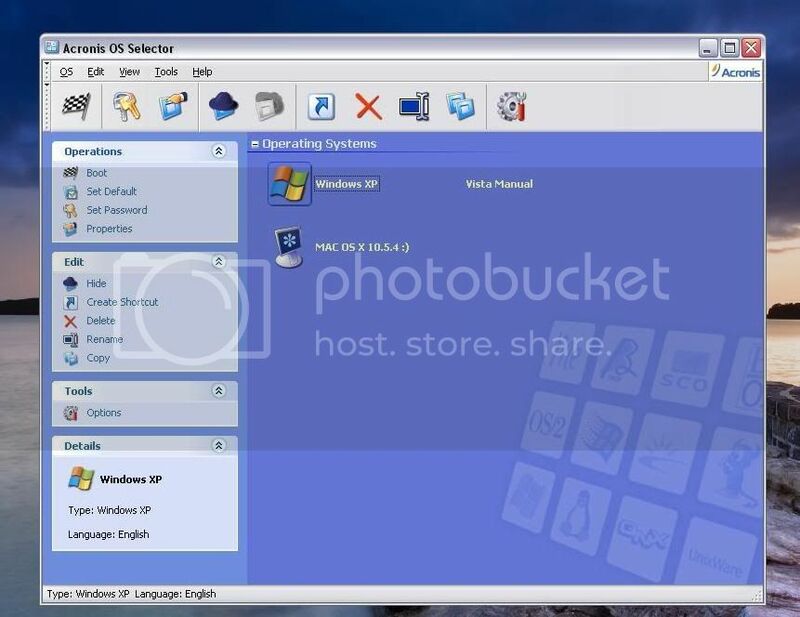 "OSS has a problem properly detecting multiple operating systems using Vista's boot manager. Sometimes it will only get one, sometimes it will get two that both boot to the Vista boot menu." If this is the case, after following your guide to seperate the two, what happens if OSS doesn't see Vista, technically I won't be able to boot into it right? Reinstalling should not be necessary. If OSS doesn't find the Vista installation (or the XP installation), it can be added manually. I can do that for you, if necessary. In most cases, you can boot into one of the OS installations. However, even if that fails, you can "fix" it so you can and then modify OSS as required. Thanks again for the great help. I will attempt your procedure and post back once I get it all sorted out. Might not be till tomorrow. Thanks for offering to make the manual change if I need it. Ok. I have completed the steps entirely and I think the results are correct. I had XP installed first with Acronis and then installed Vista prior to following your guide. Now, when I reboot, I still go to Acronis OSS. This time though when I select to boot to XP, it goes directly to XP rather than Vista's boot selector screen as it was doing prior to your guide. I have attempted to find Vista though with Acronis OSS and it doesn't find it. Here is what it all looks like. Here is a modified BOOTWIZ.OSS file to try. This assumes that Vista is setup and booting properly from its own partition. If that's not the case, the boot sector of the Vista partition may need to be fixed. Ok, I'm back in XP again. I replaced the file, rebooted, at Acronis OSS, there was a new entry in the menu called "vista manual" as shown below, BUT it was strange as there was no icon associated with it and the right click options on it weren't there expect for 2 items (one was 'view') so obviously different than my other 2 entries. *****disregard what I said about right clicking, I wasn't clicking right on it when trying to right click! Can you repost the new BOOTWIZ.OSS file so I can see if OSS changed anything? Did you check if Vista boots properly if you deactivate OSS and set the Vista partition Active using DD? I have not tried deactivating OSS and making Vista active. I will do so now. One thing to add, just prior to running your guide, I tried to boot into Vista (was working normal as I described in my first post) but this last time, it failed to boot with an error message referencing a file called 'volsnap.sys' if I remember correctly. I tried as it instructed to insert the Vista CD and do an automatic repair, but that wouldn't help it. Not sure what changed from yesterday to today prior to running your guide. The ONLY thing I can think of is that I DID swap out my video card the day before to another make. Not sure if this would play a role at all. ****before I change Vista partition to active, what's the quickest method to change it back if it won't boot from that partition. I mentioned earlier I have a great boot CD that loads some utilities I can use for this but it takes a great deal of time to actually boot this disc. I'm still not clear on exactly how you installed Vista. If you reinstalled XP and Vista and did it correctly you shouldn't have to use the separation guide. Both should already be independent of each other. The quickest way to change the Active partition is usually to boot to the DD CD and run the Safe Mode version of DD. Again, thanks for your help and the quick replies. As outlined in my first post, I had my machine running XP (and Leopard if it matters) with Acronis DD and OSS installed and running to dual boot between the two. I decided to then add Vista. My vista install simply involved booting from the install DVD, and installing vista in another newly created primary partition. I didn't do anything with OSS to run the vista install. I didn't hide any partitions when I ran the Vista install. I didn't hide any partitions when I ran the Vista install. That is what causes the problem. 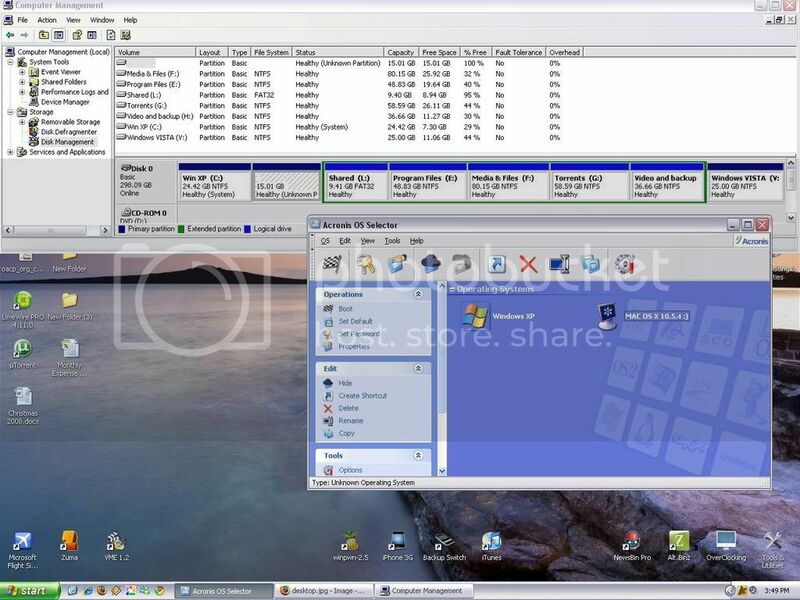 When you install Vista, the Vista partition should be Active and the XP partition should be hidden. That way Vista is forced to install everything to its own partition. OSS removed the OS type value from the BOOTWIZ.OSS Vista Manual entry. It didn't change it to "unknown". Instead, it just left it blank. Check and see if Vista will boot properly on its own before we make more changes. The problem may be somewhere besides OSS. Ok, oddly, I just used DD to set the Vista partition to 'active'. rebooted. It STILL went to Acronis OSS , booted back into XP normally. Ran DD again to take a look, and my XP partition is active?! If it helps, I really don't care about losing/starting over with my Vista partition. I DO want to salvage my XP partition and current install if I can though. Is there a way I can somewhat wipe out the Vista install and do it again properly WITH keeping XP intact right now? OSS will still boot if OSS hasn't been deactivated. Deactivate OSS (do not uninstall). Boot to the DD CD and set the XP partition Hidden and the Vista partition as Active. Boot to the Vista DVD and install Vista (have Vista reformat the Vista partition as part of the installation). Vista should install and reboot normally. Vista should boot automatically when the computer boots. OSS should find the Vista installation. If OSS shows your DVD drive and allows you to boot OS CDs correctly, you can install Vista from OSS (which means you would not need to deactivate OSS). To do this, make sure you set the OSS Vista DVD menu entry properties so that the XP partition is Hidden and the Vista partition is Active before you boot the Vista DVD from OSS. Otherwise, proceed as above (format the Vista partition, install Vista, etc.). When OSS is booted or reactivated for the first time after (or during) the Vista installation (depending on which method you use), make sure the properties for the Vista entry are correct (XP Hidden, Vista Active). Ok, I will follow your steps here and re-install Vista. I just want to make sure that this will work cleanly considering I did your 'separating' guide earlier. In other words, will my MBR, be ok to go forward with the re-install? The MBR should be fine. You may need to reactivate OSS, but that should be it. OSS is currently in the MBR. If you deactivate OSS and select XP as the default OS, the XP MBR code will be restored. If you install Vista from the OSS menu, OSS should automatically take care of restoring the OSS MBR. If it doesn't, just reactivate OSS. Why is it that even after hiding my XP partition (step 2), it still shows up during the Vista Install when you get to the screen that asks you to select where you would like to install Vista. That's normal. Vista's installer will still show the XP partition. 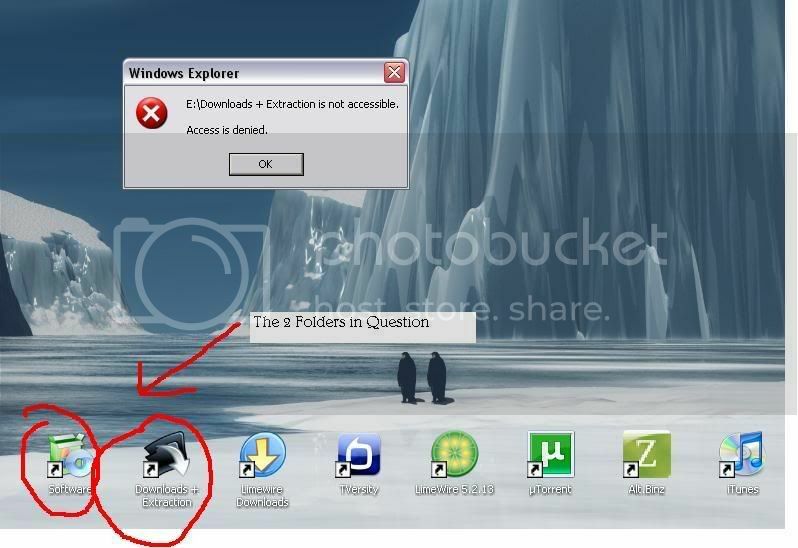 Just be sure that the XP partition is Hidden and the Vista partition is Active and you should be okay. Well, I finished installling Vista, process was fine. After completing, I rebooted from Vista back to the DD startup disk, re-activated OSS, and sadly, no Vista in the list, nor will it find it again. I'm assuming an edited bootwiz.oss will do the trick but am thinking I can't use the last one you gave me. Thanks for all the help. Definitely been a learning process. Was Vista booting okay with its partition Active and the XP partition Hidden? Were Vista's booting files installed correctly to Vista's partition and not put on the XP partition? The previous BOOTWIZ.OSS file may or may not work. It depends on if OSS changed the partition ID value for the Vista partition. Can you attach the current file? Yes vista was booting when it was active and XP was hidden. Here is the current bootwiz.oss and yes I did try the previous one you made me, it didn't work, gave the same error as before. Assuming the bootmgr file and the boot folder were previously removed from the XP partition (as part of the separation instructions), they should still not exist on the XP partition. They should be on the Vista partition. Yes the file and folder in question ARE on the Vista partition. Also, prior to the reinstall of Vista, that partition had a label to it ("Vista") since the re-install and subsequent reformat it has no label anymore. Does this affect those files in anyway?